Being able to accurately predict the risk from mosquitoes and ticks partly depends on being able to accurately predict timing and amount of rainfall. The greatest mortality factor for ticks is drying out, so to be active, they need a little rainfall every few days. For mosquitoes, standing water is where they lay their eggs and their larvae grow. Mosquitoes thrive if we have heavy rain (2 inches or more) every two weeks or so and warm temperatures. In southern and central New Hampshire, blacklegged tick numbers are a bit lower than usual, and activity has decreased due to current dry weather. Tick activity typically declines in early July and stays low through August, and blacklegged tick adults won’t be active again until about October 1. But the numbers of American dog ticks, which don’t transmit Lyme disease, seem to be a bit higher than usual. Mosquito numbers fluctuate with the rain, and currently are a bit lower than usual in the seacoast area. New Hampshire has about 46 species of mosquitoes, and some are aggressive biters. During the daytime near salt marshes, the salt marsh mosquito is an active, annoying biter. Inland, when you walk through woods and shrubbery during the day, you disturb resting mosquitoes, who readily respond by biting. Otherwise, mosquito biting is heaviest within an hour or two of sunset and dawn. The risk of getting a mosquito-borne disease in New Hampshire is pretty low overall. But the riskiest time is late in the summer and early fall, before a killing frost stops the adults. 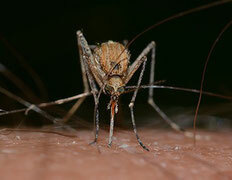 Eastern Equine Encephalitis and West Nile Virus are the most likely problems. I’m asked about Zika virus a lot now. The two main vectors of Zika virus (Aedes albopictus and Aedes aegypti) do not occur in our state, and the closest that they exist seems to be the New York City area. So, the risk of getting Zika here is probably extremely low. Lately, I have received many questions about repellants. Deet is one of our most effective repellants. It works on mosquitoes, ticks, black flies and no-see-ums. 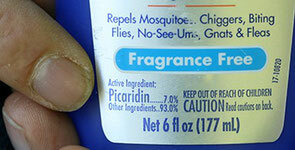 Some people can’t use deet because they are allergic to it. I don’t use it when I’m playing music because it can damage the finish of some instruments. But, there are other effective ingredients, like picaridin, you should look for.